The FrontRunner Century is unique in that cyclists travel from Salt Lake to Ogden and then take the FrontRunner train back to Salt Lake. This is the start of the 2015 event. April 21, 2016 – The FrontRunner Metric Century will be held on April 23, 2016. 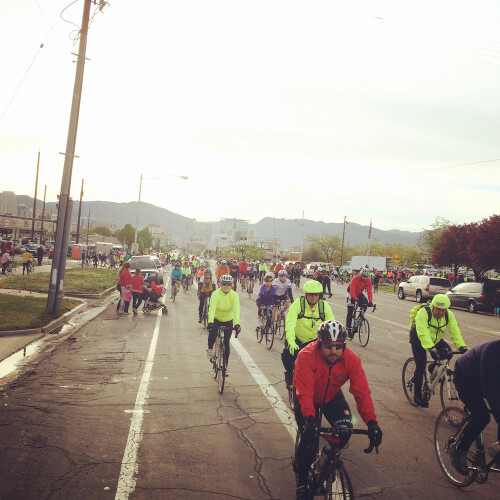 The ride starts in Salt Lake City and heads north to Ogden on the quiet back roads of Davis and Weber Counties. The ride sets itself apart from most other centuries in that it is a point to point event. We caught up with event promoter Matt Storms and asked him to fill us in on the 2016 edition. Cycling Utah: Tell us about the course. What are the highlights? FrontRunner Century: The Front Runner Century is a mostly flat course with less than 700 feet of total climbing over 62 miles. This is the perfect spring ride to stretch your legs or a great ride for those new to cycling. The biggest thing that sets our ride apart from others in the valley is that we provide a point to point course from Salt Lake City to Ogden, with the option to ride the Front Runner train back to Salt Lake. CU: What level rider will feel comfortable on the ride? FRC: This is the perfect ride for all levels and ages and everyone is welcome, as well as tandem and recumbent bikes. We promote our event as a ride and not a race to more fully reflect that this event is for everyone. CU: Tell us about what makes this ride really cool. FRC: Did I mention the train ride? It really is a unique and fun aspect of our event. In addition to that we have awesome volunteers that help make our event run smoothly. Rain or shine, they always go above and beyond. CU: The Front Runner Century raises funds for several charities. Tell us more about this effort. FRC: A portion of the proceeds benefits the Crohn’s and Colitis Foundation. My brother has suffered from Crohn’s most of his life so I wanted to be able to give back to a cause that meant something to me. The last couple of years a lot of our volunteers have been Active Duty and Reserve Navy and Air Force personnel, so we give a donation to those groups as well. CU: How often do you have rest stops? FRC: The past 5 years we have had 2 aid stations in addition to the finish. This year we are adding a third aid station after getting some feedback from our SAG support. CU: What sorts of things do you stock? FRC: We try to have a variety of things so there is something for everyone. We have Probars, pretzels, bananas, licorice, trail mix, Gatorade and water, to name a few. We’ve been told by many of our riders that our event has the best aid stations in the state. CU: How many riders do you expect this year? FRC: We are expecting around 800 riders this year. CU: Is there anything else you would like to add? FRC: Yes, if you haven’t registered, what are you waiting for!?! In all seriousness, we love putting on this event and strive to make it better each year. We care about the community and love being able to provide an event that supports the health and well-being of cyclists in a fun way, all while giving back to some great causes.